Cisco is known for the inconsistencies between platforms and different IOS versions. I came across another that was rather annoying. Now between linecards. The purpose of VRF-lite is to extend the logical separation of two different networks from a MPLS network down to a single CE router, connected to both these networks. It’s called VRF-lite because it is done without running MPLS (LDP/TDP) or MP-BGP between the PE and CE. Traffic is mapped to the VRF assigned to the ingress interface on the CE router. But VRF-lite could be used without connecting to a MPLS network entirely! Consider what a VRF is? A VRF is a mechanism used to provide logical separation between routing tables on the same router. It is locally significant to the router. Each interface on a router can only be assigned to one VRF, but a VRF can have multiple interfaces. Once you have the separation you needed, you might need a way to selectively bridge that separation to allow communication between the VRF’s. I came across the following command browsing the DOC-CD a couple months back, and I have used it ever since. The show running vrf feature provides the option to display a subset of the running configuration on a router that is linked to a VRF instance. It can be used to display the configuration of a specific VRF or of all VRFs configured on a router. The command is unfortunately only available on the more recent IOS versions, but if available makes life easy. 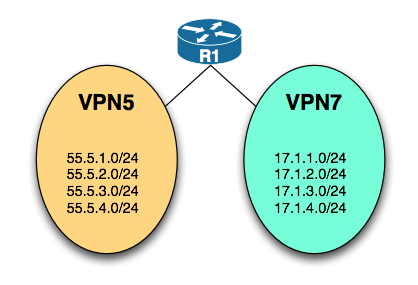 The different methods to attach MPLS VPN RTs when routes are exported from a VRF table can be confusing. This could be done in two ways with additional options. The default ‘all’ export RT could be used. Or the RTs could be attached using an export-map. The first method is the most common and the easiest to understand. The command below will attach the configured RT to any routes exported from the router’s VRF RIB table into the MPBGP table for advertising. But what if another RT should be attached in place of, or additionally but for only one prefix? This is where the second method becomes necessary. By using an export-map one can selectively attach RTs to individual prefixes, separate or in conjunction with the default export if it is configured. This usually raises the question of when the ‘additive’ keyword is needed.